It’s crucial for organizations to have a strong web presence. Unfortunately, the Internet doesn’t come with an instruction manual, and it’s easy to go wrong. Here are 8 ways your website might be at risk and how to be proactive in solving these issues. In the last year, organizations all over the U.S. have been getting demand letters from lawyers and disability rights advocacy groups. These claims allege that the organizations’ websites are violating Title III of the ADA (American Disability Act). These claims generally ask that recipients pay a settlement and that they modify their websites to become compliant with the World Wide Web Consortium’s Web Content Accessibility Guidelines (WCAG 2.0 AA). Nearly any organization with a non-compliant website is at risk of being sued. And yes… the plaintiff usually wins this type of case. Here’s why it’s important to be compliant: Vision-impaired and hearing-impaired customers often need to use special software and assistive technologies to navigate the Web. Other individuals might be unable to use a mouse, and must use voice recognition or a touchscreen. Basically, WCAG 2.0 compliance means that your website works smoothly with these tools, allowing just about anyone to use your website, regardless of their abilities. Needless to say, it’s better to ensure that your website is compliant before you receive a claim letter. That way, you avoid having to pay a settlement. You’ll also be able to serve a wider range of customers, so WCAG 2.0 compliance benefits you in more than one way. If you’re unsure whether your site has all the correct legal sections, you need a website attorney to go through your site and make sure everything is in place. If you used generic templates for any of the legal sections, you’ll probably need to have a web attorney tailor those sections specifically to your company’s products or services. Why is this so important? It’s simple: not only are legal pages required by law, but they also help build trust with your customers. When you search Google for a specific product or service, chances are you’ll click on the top result. You might not even scroll to the bottom of the page, let alone check out the second or third pages of results. So, where does your business’s website stand? Are customers able to find your site quickly and easily with a Google search? If you’re experiencing low traffic to your website, or if it’s never been optimized for search engines, you should hire an SEO expert to make sure customers can find your website amongst all the competition. This is a big deal for ecommerce businesses or any website that has an online checkout option. PCI DSS stands for Payment Card Industry Credit Data Security Standard. Every merchant that accepts credit or debit cards is required to follow PCI DSS standards. You’ll need someone to go through your site to assess your risk level as a business, make sure cardholder data is well protected, and ensure your site is safe from attacks. Noncompliance fines can cost you thousands of dollars. A breach in cardholder data is a serious issue, as you well know. It’s your responsibility to make sure your network, and your customers’ data, is safe. Hiring a pro to assess your PCI DSS compliance is a vital way to mitigate these risks. WOT, or Web of Trust, is a global repository of trusted and non-trusted websites. Is your website known for spam, malware, tracking, or other serious problems? Is it flagged by firewalls? Having a “suspicious” website will seriously affect your traffic and, in turn, will hurt your company’s reputation and its success. Many times, website owners have no idea that they’re on this list of non-trusted websites. When you hire someone to review the trustworthiness of your site, you can ensure people are able to access your website without risk. If problems show up, your web expert will figure out how to get your site on the “trusted” list once again. W3C is a set of standards developed by the World Wide Web Consortium. It is basically a “best practices” approach to web development. When your site is W3C compliant, it provides the best experience possible for its users. This includes enhanced ease of use, mobile accessibility, disability compliance, and general improvement in navigation, visuals, text, and more. When you hire a web developer who is familiar with W3C standards, you have a whole lot to gain. Following the best practices can really help your website stand out from the competition. A W3C-compliant website creates an excellent reputation for your company and a pleasant, user-friendly experience for everyone who visits your site. A professional website security reviewer will be able to assess the safety of your website. Then, they can take any necessary steps toward tightening up your security. A secure website ensures you and your customers are safe from vulnerabilities that threaten your reputation and your sales. How quickly do your website’s pages load? Does it take less than a second, 3 seconds, 5 seconds or more? Every second that goes by makes people more likely to click away. It’s very important to make sure your site loads as quickly as possible. Otherwise, you’re losing customers before they even read anything on your site. This is a huge missed opportunity. A web development pro can easily go through your website, assess its speed, and figure out ways to make it load faster. This could be as simple and quick as resizing some images or organizing your site differently, but it could make an enormous impact on your business’s web presence. 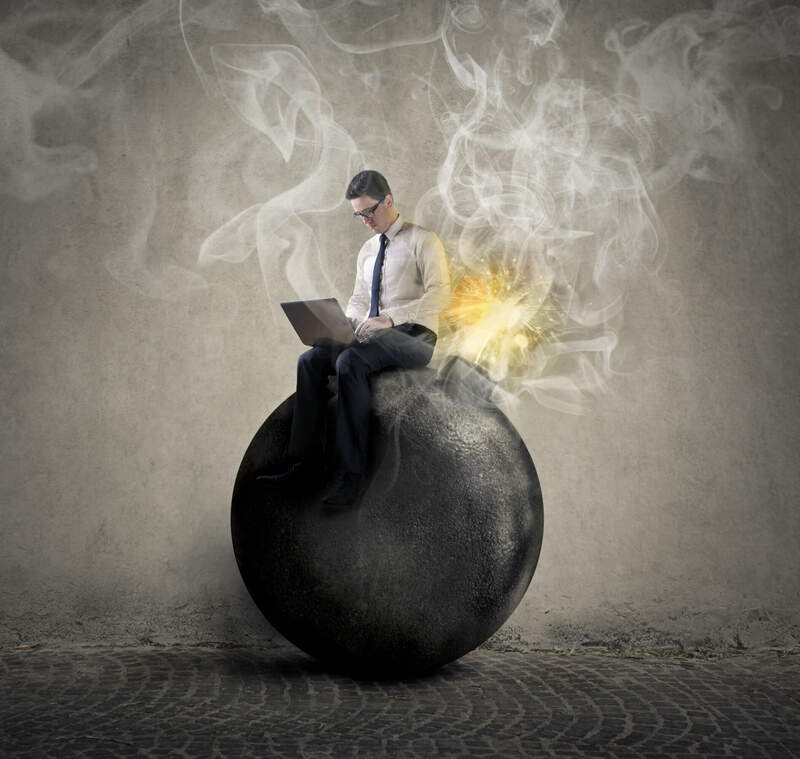 So, Is Your Site (and Business) at Risk? Be Proactive! At Levi Marketing, we go the nth degree to help our clients stay compliant and remain safe and successful on the Web. We offer professional, tailored services to help you with all 8 of the risks listed above. So, if you’re concerned that your website needs help, Contact Us Here to get in touch with our team.